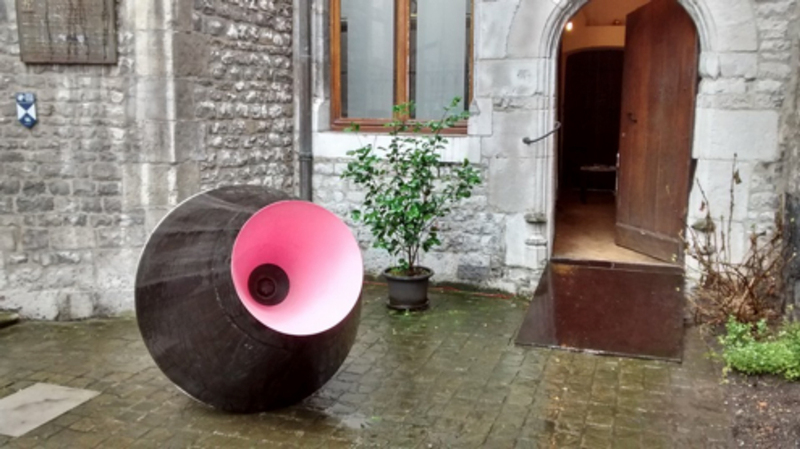 Welcoming the audience at the entrance will be Olivier Bovy’s audio sculpture HONK, hurling sounds that are difficult to identify. Is it animals screaming or people roaring? The sounds are taken from a 2001 soundtrack for which Bovy played with sounds that arise from his mouth, yet surpass words. Through sighing, groaning, screeching, grinding, neighing and wailing, HONK communicates with its audience. HONK is a modular sculpture, its appearance thus flexible and its characteristics and functions subject to change and differentiation. Like a UFO or reminiscent of a roundabout, a buoy or a howling seal, the sculpture escapes definition and is extremely active.